Lychee bubble tea syrup used to make Lychee boba tea smoothies, Lychee boba slushies, and Lychee flavored green / black tea. Looking for that sweet and juicy flavor of that Lychee fruit you enjoyed while on vacation? This tasty fruit is an ideal ingredient in creating delicious desserts in many Oriental countries. Add some flavors of the orient to your beverages with our Lychee Syrup. 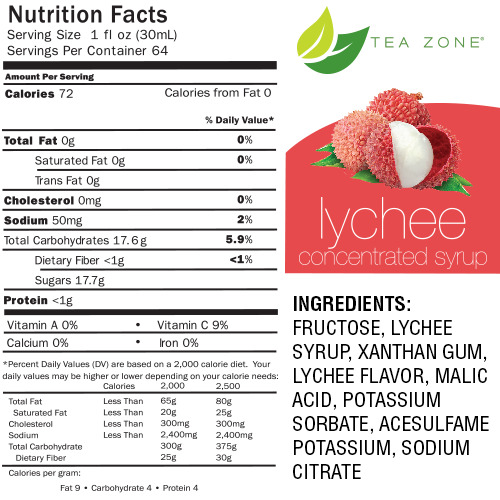 Infused with natural lychee flavor, this syrup ensures a delicious and refreshing drink at all times. For a sweet iced tea drink, simply mix this syrup with some ice, water and tea mix and blend well before serving. Like this item? Try our Mango Bubble Tea Syrup!